The Celtics had a surprisingly tough Hawks squad waiting for them in Atlanta tonight and after a tough battle, they came out on top once again with a 110-107 win. Boston came out at the start playing very well, working the two-man game with Al Horford and Kyrie Irving once again. Horford, in his 4th game back in Atlanta since coming to Boston, had 7 points, 4 rebounds and 3 assists all in the first quarter. The Celtics led by one, 26-25 after one quarter of play. The Hawks bounced back in the 2nd period and really ramped up their use of the pick-and-roll with Dennis Schroder and Dewayne Dedmon. Dedmon and Schroder each had 13 points in the first half and the Celtics had some trouble keeping Dedmon away from the basket. 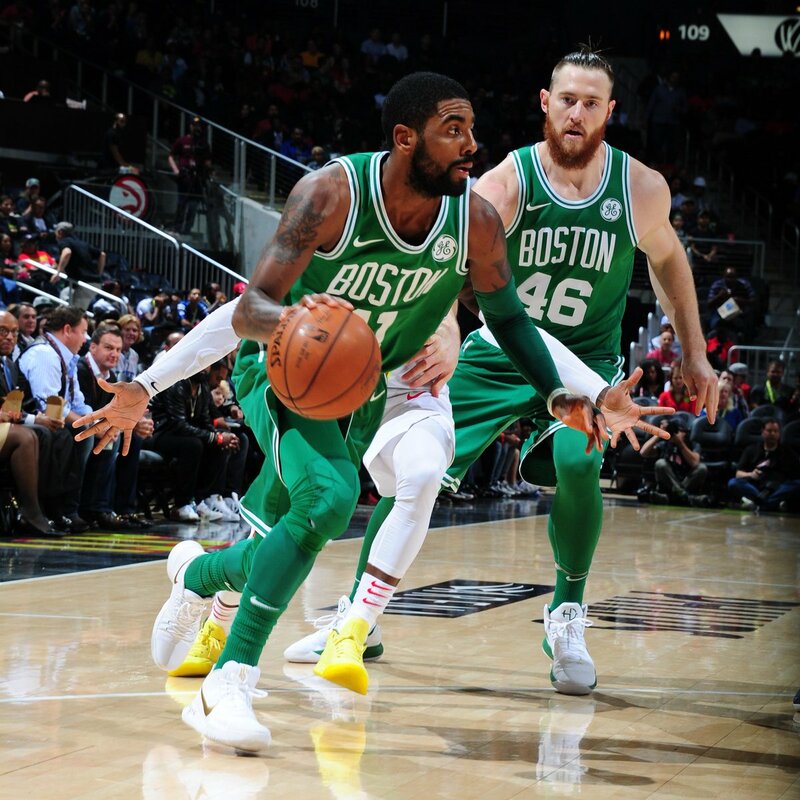 After a 10-2 run by Atlanta, the Hawks led 44-38, but Kyrie Irving got hot and carried the Celtics back into the game with his tremendous passing and shooting. After a surprisingly competitive 1st half, the Celtics and Hawks went into the half dead-locked at 54-54. Irving led all scorers in the half with 16 points. The second half started off as a back-and-forth affair yet again with Dennis Schroder scoring the first 8 of Atlanta's points in the half. At one pointed after a Marco Bellinelli three, it looked as if the Hawks had Boston on the ropes up 71-64 but thanks to the playmaking of Kyrie and some Jayson Tatum threes, the Celtics went on an 16-2 run and went up 80-73. The C's closed out the quarter up 82-75. The Celtics got some good looks to start the final quarter, which included a daily Semi Ojeyele three from the corner. However, Atlanta had some fight left in them and started to climb back into the game thanks to threes by Malcolm Delaney and shots by Marco Bellinelli who was the spark off the bench for the Hawks. Things got worse when Kent Bazemore hit a go-ahead three point shot with five minutes remaining in the game. The two squads traded buckets and free throws back and forth and it remained a one point game with nearly three minutes left in the game. A Malcolm Delaney three with 1:52 left put Atlanta up 103-101, but that was answered by a monster clutch three from Irving to put Boston back on top 104-103 with 1:30 left. Dewayne Dedmon couldn't get a 15 footer to go on the next possession, which set up the rookie Tatum with a corner three, which he absolutely nailed to put Boston up 107-103. After two Bellinelli free throws to make it 107-105, Irving took the rock with the clock dwindling and nailed a floater in the lane to ice the game and put Boston up 109-105. For the Celtics, Kyrie Irving finished with 35 points, 19 of them in the second half. Al Horford flirted with a triple double posting 15 points, 10 rebounds and 9 assists. Jayson Tatum added in 21 points and 8 rebounds while Jaylen Brown had an off night but still contributed with 11 points. For the Hawks, Dennis Schroder led Atlanta in scoring with 23 points. Dewayne Dedmon put up a double double with 17 points and 12 rebounds. Malcolm Delaney and Marco Bellinelli added in 13 points and 17 points off the bench respectively. The Celtics now with a 9-game winning streak, move to 9-2 and come back home to title town to take on the Lakers on Wednesday night. Tipoff set for 8:00pm E/T.